RC Submarine Diving Technology and Links! This page contains information about Model Submarine Dive Systems as well as a few of my Favorite Links. Feel free to look around. Let me know if you see anything that needs changing, or if you have any ideas for anything that you'd like to see here! Perhaps the simplest form of diving technology is the dynamic diver. This model submarine has no functional ballast system at all, but rather uses its dive planes to “push” it under the surface of the water. In order to dive, the model must be moving forwards at a respectable pace, enough that the pressure exerted by the dive planes are sufficient to overcome the buoyancy of the model itself. These models usually feature rather large dive plane surfaces, and are also normally ballasted (weighted) very low in the water so that their reserve buoyancy is as low as possible, the planes can be as small as possible, and the resulting necessary forward speed to dive is as slow as possible. Always positively buoyant and will return to surface if model loses power. One of the more popular ballast systems employed in North American model submarines is the Gas Ballast System. In this system, liquefied gas is stored on board the model in a pressure vessel, and is expelled into the ballast tank in order to displace water and bring the model to the surface. Operation is typically achieved through the use of a single servo. In one direction, the servo operates a vent located at the top of the ballast tank, releasing air and allowing water to enter. In the other direction, a Schraeder (standard tire) valve is depressed in the pressure vessel, releasing the liquid air into the ballast system and displacing the water. Care must be employed when filling the pressure vessel, as the liquid air is extremely cold when it reverts to a gas, and frostbite can easily occur if flesh is exposed to it. This system also has a propensity to “freeze” up if too much air is released at one time. Operators of these boats quickly learn to count their blow/vent cycles in order not to run out of air in the pressure vessel. If care is not employed, the model will run out of air and will not be able to surface again. Most model submarines can achieve between 8 and 12 cycles before requiring refueling with liquid air. One of the most popular ballast systems in Europe is the Piston Tank Ballast System, made most famous by the German submarine kit manufacturer Alexander Engel. These systems can be quite simple (basically a large plunger moving in a sleeve driven by a motor), or very complicated with multiple tanks and computerized control. The more complicated systems will include multiple (typically two) piston tanks located forward and aft. This allows control of pitch by making one tank slightly more or less full than the other. Complete dive systems such as Engel’s TMAX system allow for very precise control of buoyancy, to the point where the model can hover autonomously at a prescribed depth through the use of pressure sensors. With these systems, air is evacuated from the tank and is forced into the surrounding enclosure for the ballast tank. These are most commonly used on “dry hull” submarines, or submarines with a large volume of dry area within. As the tank is filled, the air is forced into the dry area, increasing the air pressure there. Care must be made when designing these systems so that seals and access hatches are able to withstand the pressures not only pushing inwards by water, but pushing outwards by internal air pressure. When utilizing a single tank, the trim of the submarine will be affected during the fill and empty cycles as the center of gravity of the model shifts as water is taken in. These systems are quite robust and require little maintenance. Cons: Takes some time to work from full to empty or back again. The Vented Tank Model is not a truly static diving boat, but is rather a very close approximation. In this system, the flood valve is opened and air leaves the ballast tank through the vent, which typically exits very high on the model, hidden as a periscope or mast. Water enters the ballast tank from the flood valve until the model is fully vented, at which time it will be sitting at “decks awash” or slightly positively buoyant. With the reduced buoyancy, the boat’s dive planes can now be used to pull the boat downwards and under the water with little effort and lower speeds. To surface, the flood valve is closed and the positive buoyancy of the model brings the boat back up to the “decks awash” state. A small pump then pumps water out of the ballast tank, drawing in air from the surface through the vent mast. Many times this system will be used in conjunction with another system that will allow the model to be taken to neutral or slightly negative buoyancy. The simple operation and elimination of the need for liquid air onboard makes it a good choice for a ballast system. In this system, the air in the ballast tank begins at an ambient pressure. The valve is then opened and water is pumped into the ballast tank, compressing the air, reducing its volume and making the model heavier. When the pump can no longer pump any more water into the tank, or when the desired buoyancy is achieved, the valve is shut and the pump turned off. Assuming a good pump is found, a modeler can expect to be able to utilize approximately 70 to 80% of the volume of their ballast tank. To surface, the valve is simply opened and the resulting avenue of escape for the pressurized air forces water through the pump mechanism and out of the model, allowing the air to expand and causing the model to become positively buoyant once again. If a leak develops in the valve system, the model will inherently blow the ballast, causing the model to surface. The rather complex nature of the Compressed Air System and the need for a large volume to mount the internal mechanisms makes this system more uncommon than others. In this setup, the main ballast tank has one outlet and one inlet. To dive, the vent valve is opened, and water enters the ballast tank through openings in the bottom. To surface, the blow valve is opened, and compressed air enters the ballast tank from the storage vessel. Typically, the compressed air system has only enough compressed air for a maximum of three cycles due to limitations on storage vessel size and the maximum pressure obtainable by the compressor. The number of cyclers can be as low as one, depending on the ballast tank size and the size of the storage vessel. The system needs to be “recharged” between cycles when surfaced. To recharge the system, the storage vessel charging valve is opened and the compressor is turned on. Air is pulled from the surface through a float valve in the conning tower or periscope that prevents water ingress, otherwise water would get into the compressor. The compressor charges the storage vessel until the desired pressure is reached, and is turned off through the use of a pressure sensor which also trips the closing of the charging valve. These systems are typically very noisy when charging. The RCABS systems are becoming more and more popular in the North American modeling crowd due to the fact that they durable, and require no outside source of air to operate. There are two versions of this system. In the true RCABS version, the model begins on the surface with a partial vacuum in the WTC and the ballast bladder inflated. Diving is accomplished by opening the valve that leads to the water tight cylinder’s interior. The vacuum in the WTC pulls air out of the ballast bladder, deflating it and causing the boat to dive. To surface, the valve is closed and the air pump forces air into the bladder, causing a partial vacuum once again inside the WTC. With this system, a loss of battery power means that it will not be possible to surface the boat. The other version is called RCABS-R. In this system, the air in the WTC always remains at ambient air pressure. The boat begins on the surface with the bladder inflated and the compressed air storage vessel at ambient pressure. To dive, the blow valve is closed and the air pump pulls air from the ballast bladder and pushes it into the compressed air storage vessel. Once the bladder is deflated, the pump is shut off. The advantage to this system is that if there is a loss of power, or a low battery condition, the boat will not want to dive. Also, if there is a leak in the valving, air will return to the ballast bladder and the boat will surface. 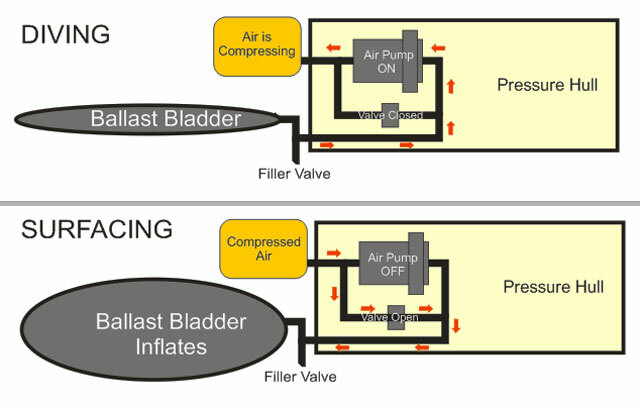 With this system, a filler valve must also be fitted in order to get the bladder inflated once the system is closed off. Both systems require one-way valves at the pumps to stop air from being forced through the pump. The following links mostly pertain to either RC submarines, or the Nautilus herself. My favorite links are always being updated... please keep checking back here for updates. Do you know of a great RC Submarine site? Let me know and I'll be happy to add it to My Favorite Links! Caswell Plating - Home of the SubDriver WTC system and source for R/C Submarine kits. Great place for the beginner to get everything they need to get started! Dave Merriman's RC Subs - Dave is toted as being the "RC submarine expert"
The Scale Shipyard - Lee has lots and lots of hull kits for sale, both submarine and \"targets\"
Alexander Engel - High quality, high-tech submarines for the experienced modeler! Mike's Sub Works - Mike is a great guy with super customer service. Check him out for sub-related running gear! Big Dave's Experimeter's Kits - Dave sells kits to build your own WTC's for R/C subs that use no gas, but use pumps instead. Homebuilt ROV's - This site was instrumental in helping me get my own ROV project completed. Check it out! SubCom Ontario - This is the official website for the Ontario chapter of the SubCommittee. Lots of great photos and information! Wayne Frey's Russian Submarine Site - Soon to be the premiere resource in the world for Russian sub info! Typhoon - How To build a Russian submarine! - John's Website chronicling the scratchbuilt construction of his massive Russian Typhoon R/C model! Jonathan Leslie's Paper Nautilus Kit - 36" long kit available for purchase from Jonathan. Jules Verne\'s Nautilus - Michael Crisafulli\'s Nautilus site is the best Vernian Nautilus site on the net. Vulcania Submarine - Pat Regan's site with info on his 18' long manned minisub, 20K diving suit and much more! Glow, Inc. - The manufacturer of the great glow-in-the-dark powder that I used on my 16" Brodeen Nautilus. History and Parts of the Submarine - Lots of great information here about the history of the submarine, general submarine information, and lots of links! The Caswell Sub Driver's Forums - Home of the Caswell SubDriver Forums and lair of David Meriman III, Godfather of RC Submarines. SubPirates - A good source for info. There's also some sub-categories for planes and tanks. Model Boat Mayhem - UK-based site for RC boats and subs!